Shortly after last year’s Ironman World Championships, the team at Austin Tri Cyclist posted a blog entry analyzing trends in bike splits in Kona since 1988. I expanded on that analysis in an article for Active.com, but that only led to further curiosity. The respective data crunches occurred just as major debates about the compensation of professional athletes and the inclusion of female pros at the Kona start line were heating up. It occurred to me then that a relevant aspect of the debate is what professional athletes are contributing in terms of sheer athletic performance. In the most general sense of athletic endeavor, professionals are considered the elite performers—the apex of the talent pyramid. As such, they simultaneously reflect the strength of the base while pushing the upper reaches of its height. A more detailed analysis of pro athlete times at the sport’s premier event should therefore tell us some very important things about the status of today’s pro field, and the sport as a whole. Over the next few months, TRS Triathlon will publish the results of our comprehensive statistical analysis of professional Ironman performances reaching back to the October 1982 race. This installment provides a basic overview of trends in overall performance in order to establish background and give our less mathematically inclined readers a soft introduction to the methods used. The analysis performed by Austin Tri Cyclist used single points of data taking the average bike split of pro male athletes in each year at Kona. There are a couple of limitations to this approach. The best way to explain is a simple thought experiment to find two numbers whose average is 20. 19 and 21 work, but so do 10 and 30. The average of the first pair is very representative because they’re close to each other. The average of the second pair is less representative. So, if we compared the two sets and said that based on their averages the two sets were equivalent, our analysis would be mistaken. This means there are two ways to consider whether the pro field is improving over time. One way is naturally to see if the average finish time decreases. The other way is to see if the elite finishers are very close together (uniformly elite, competitive performance) or very spread out (one or two elite athletes dominating a pack of “stragglers”). 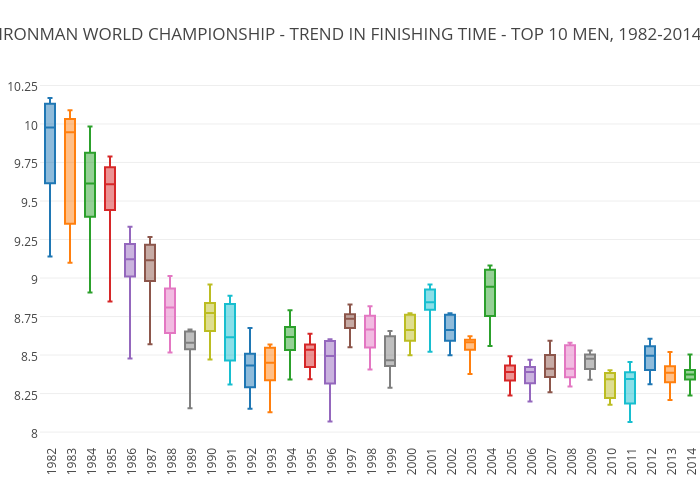 For our analysis, we took the data from the top ten finishers in the male and female pro fields for every edition of the Ironman World Championship since October 1982. Our first chart shows the results for the male pro field analysis. First, a quick explanation of the graphics. This is a standard “box and whiskers” plot showing the extremes, median, and upper and lower quartiles of the top ten finishers. The extremes are most easily identified by the “T” endings of the top and bottom “whiskers.” These represent the winner and the tenth place finisher in each race. The next most easily identified point is the median value, which represents the fifth place finisher. It is represented by the horizontal line inside each box. The median gives the box the appearance of being split into an upper and lower section. These sections represent the upper and lower quartiles of the elite field. With the math definitions out of the way, here’s what it boils down to. The end of the bottom whisker shows the fastest man in Kona each year. The end of the top whisker shows the tenth fastest. The box basically shows where 3rd-7th place finished, with fifth in the middle. That said, we can say that the elite men’s field in Kona has significantly improved over the last 35 years. Not only have the fastest men gotten faster, their first nine pursuers have gained on them. In fact, the modern men’s race is a nail-biter compared to what it was twenty years ago. Beyond those two overall trends, we can delineate three distinct “eras” of progress in athletic performance at the Ironman World Championship. The first era, between 1982 and 1990, is one of rapid improvement in overall race performance. Finishing times decreased at a rate that hasn’t been observed since. However, because this period was so dominated by Dave Scott and Mark Allen, we see that the winners’ times extend far ahead of the rest of the competitive fields, which are themselves spread quite thin. Scott and Allen were legends in their own time, far ahead of their rivals. But, statistically speaking, their competitors were not necessarily rivals even to each other, let alone those two champions. Those fields began to tighten up in 1986, leading to a very close race in 1991 in which the leader was chased hard by the entire group for the first time. The second era, from 1991 to 2005, is one of highly erratic performances on a year-to-year basis. Finishing times among the winners generally slowed down. The competitive field fluctuated in its spread, but generally remained highly competitive. The third era, from 2006 to the present, appears to indicate a “new normal” and perhaps even a stagnation in performance at Kona. The competitive fields are the most consistently grouped of all, and their spread is extremely narrow. Aside from Craig Alexander’s record-breaking performance, few winners are running away with the whole game. There is less year-to-year variation than during the previous two eras. If this trend continues and Crowie’s record stands for several more years, it may suggest that Iron-distance racing has reached the equivalent of the 2-hour marathon barrier. The races themselves will hold more excitement due to the greater contention among the top ten finishers, but the ultimate conclusion may become rather anti-climactic. Part of the drama of the elite race used to be the implicit question “how fast will they do it this year?” It seems we may finally have the answer. If so, we won’t have as much drama. We now compare the men’s history to that of the women’s field. It is actually quite surprising that the women’s field closely mirrors the progression of the men over time due to the fact that the competitive field for women has traditionally been a fraction of that of the males. One might naturally suspect that with a smaller population there would be a smaller elite group, and consequently the last five of the top ten finishers might be hours behind the winner. It is therefore phenomenal that of the mere handfuls of women that took on the Ironman between 1982 and 1991, a group of athletes emerged to compete according to trends similar to the men. While Mark Allen’s winning time in 1991 was a 9% improvement over that of Dave Scott’s 1982 time, Paula Newby-Fraser improved on Julie Leach’s 1982 finish by 16%. It’s also remarkable that Newby-Fraser was faster in ’91 than Scott was in ’92. The rest of the women followed suit. Women’s finishing times improved at a rate faster than the male cohort. However, unlike the males, the women’s pro field remained a fairly staggered affair throughout 1991 into the second era from 1991-2005. 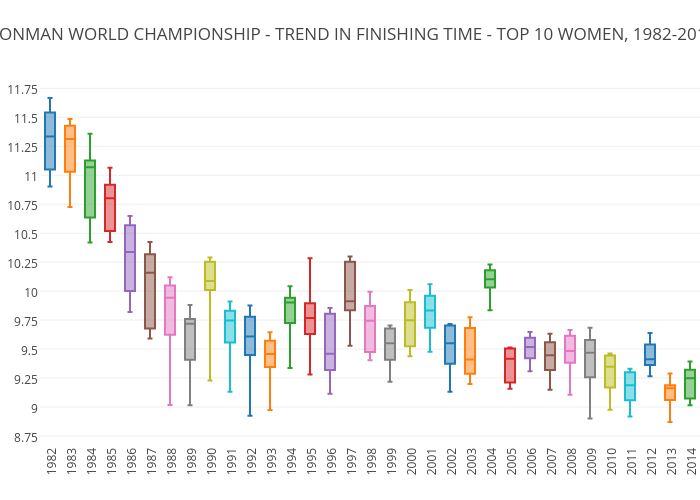 We see the same erratic trend with finishing times generally increasing between 1991 and 2005 in the women’s field. We’ll investigate this phenomenon in greater depth in future installments. Finally, the women most closely resemble the men in the modern era from 2006 until the present. The competitive field has finally tightened to a very contentious race. Even with the unprecedented times posted by Chrissie Wellington and Mirinda Carfrae, the top nine women have continued to gain on the winner over the last nine years. However, the slightly greater spread in the field suggests that the women have not quite yet reached their full potential, and therefore it’s more likely the course record will be broken in their division than in the men’s race. Statistically speaking, the odds are that there will be more drama in the women’s race over the next five years. It only increases the peculiarity of WTC’s decision to cut the women’s field to 35 slots. This analysis only covers the overall finishing times, and only in the most general sense. Our future installments in this series will dig deeper into the numbers and assess just where and how athletes conquered the course over the years. We’ll investigate whether there was ever any validity to the myth of the “uber-biker,” where the champions pulled away from the field, and where the elite performers are (and aren’t) making their getaways. The findings are interesting, to say the least. Don’t miss out on future installments analyzing 35 years of Ironman Kona statistics, sign up for the weekly TRS Triathlon newsletter.